At the Brandywine, we know that the Valley is a magical place. But for those who feel the Valley isn't a winter destination, think again. From the holiday magic on the agenda at Longwood Gardens, to a bundled up walk through the town's local shops, here is a guide to your new favorite winter wonderland. If you're looking for a post-Christmas hike to stretch your legs and get that body on the move again, hit the one of the state parks in the area. While some days may be a little too cold for any outdoor activity, there are plenty of mild winter days perfect for exploring the lay of the land. The parks are maintained all year round, so there's no excuse to spend those days in the Brandywine cooped up indoors. Come on, get out there. 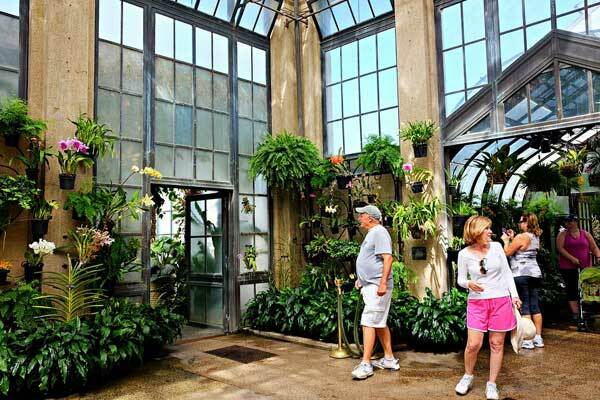 Situated in the rolling hills between Philadelphia and Delaware, Longwood Gardens is one of the crown jewels of the Brandywine Valley. If you're looking for a place to get into the holiday spirit or take a reflective later winter walk - this is the place for you. The park was founded by the famed du Pont family - a rolling expanse of gardens that take visitors back in time with its European influenced décor. If you happen to be visiting during the holiday season, it's worth pointing out that the Longwood Gardens is a sight to behold, decked out in Christmas lights. An elaborate holiday outing that's really worth checking out. The Brandywine River museum is a unique showcase of American artwork. You'll see famous works from the Wyeth family, as well as some modern masterpieces. The Brandywine River Museum is housed in a rustic, old milland per the official website, comes at the crossroads between nature and art. Definitely worth visiting on a cloudy winter day. Almost too many spots to name, the Brandywine valley features a solid lineup of quaint shops, galleries and more. Check out Kennett Square, the so-called "mushroom capital of the world", and grab some take-home bites at the Mushroom Cap or Talula's Table. Or grab some Italian at local spot, La Verona. If you do end up hitting the Longwood Gardens, it's worth stopping by their restaurant, the 1906. An upscale dining room with farm to table cuisine and a solid selection of wines, this little spot is big on quality and sustainability. Each meal comes with a complimentary amuse bouche, and a brioche roll. More dining ideas right here. Grab a camera, pack a bag, and head on out to the valley. We hope we gave you some inspiration for your next getaway. And we'd also like to suggest looking at this guide for photo printing options. You're going to want to remember these views. We may be partial, but given that the du Pont family could have settled down anywhere, we think that's indication enough that the Brandywine Valley is pure heaven on earth.